All employers have a duty to check that their employees are legally entitled to work in the UK. Since the Immigration, Asylum and Nationality Act 2006 came into effect, knowingly employing an illegal worker has been a criminal offence. At the same time employers face civil penalties of up to £20,000 per illegal worker found without having obtained a statutory excuse. Establishing a statutory excuse gives employers a defence against conviction and an excuse from payment of a civil penalty if they are found to have employed an illegal migrant worker. A compliant ID check is where employers can provide copies of the allowable documents for all relevant employees and can prove that the required steps were taken when checking these documents. But do you know how to establish whether an ID document is counterfeit or genuine? 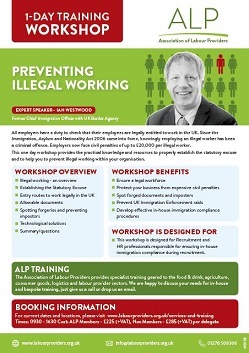 This one day workshop provides the practical knowledge and resources to properly establish the statutory excuse and to help you to prevent illegal working within your organisation. Presented by a former Chief Immigration Officer with the UK Border Agency. Ian is Director of The Westwood Organisation (TWO) Ltd and a former UKBA. This workshop is recommended for Recruitment and HR professionals responsible for ensuring in-house immigration compliance during recruitment. Contact: 01276 509306 or email if you have further questions.